Luke Martin (5) had eighteen points after the first half. (Amesbury MA) Luke Martin was part of Amesbury’s problem in the first half. The second half? He was a big part of the solution. 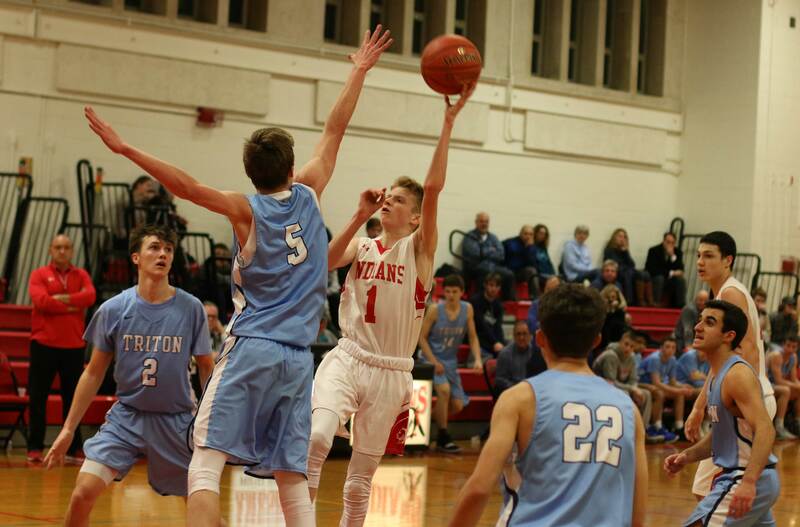 Amesbury rallied after a half of subpar defense/offense to reach overtime with Triton and then dominated overtime to scratch out a, 61-58, win on Tuesday night. “We played a zone early and Triton made a bunch of three’s,” said Coach Tom Comeau afterwards. The solution? Change to a man-to-man and apply ¾ court pressure after baskets. 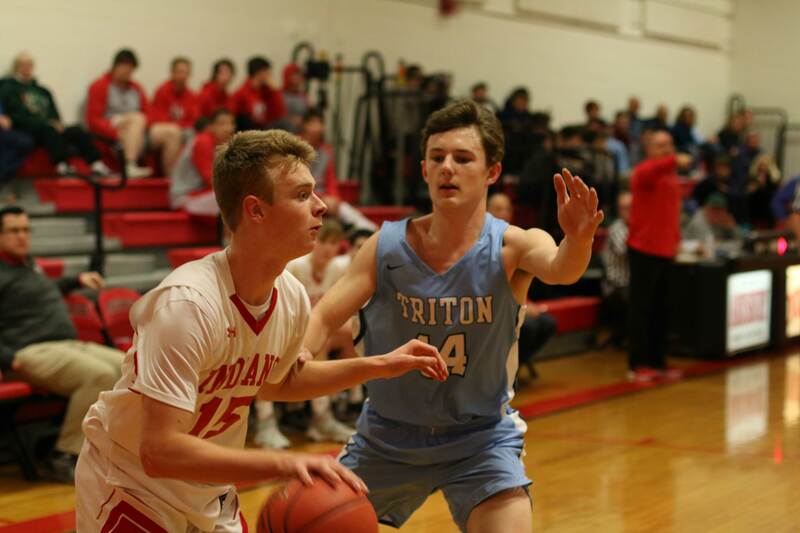 The Indians (3-5) trailed by fourteen (31-17) at the half and the way Triton was shooting made you think that the lead might get bigger in the second half. “I challenged the team at halftime to play better and protect the homecourt,” said Coach Comeau. It worked for certain. But the Vikings (5-6) didn’t go away despite the improved play of the home team. 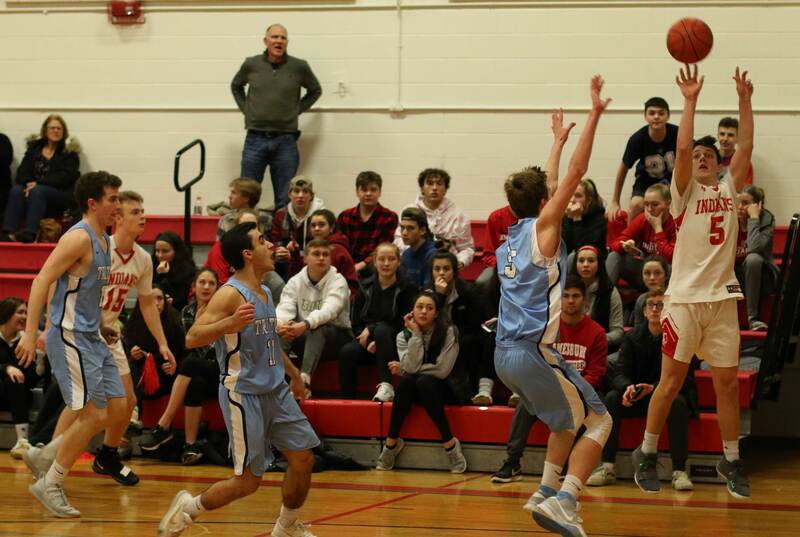 However, the Triton lead started to shrink in the second half and when Jimmy Gjikopulli hit a runner in the lane with two minutes left in regulation, Amesbury was ahead for the first time, 48-47. Those expecting Triton to now quit were disappointed. 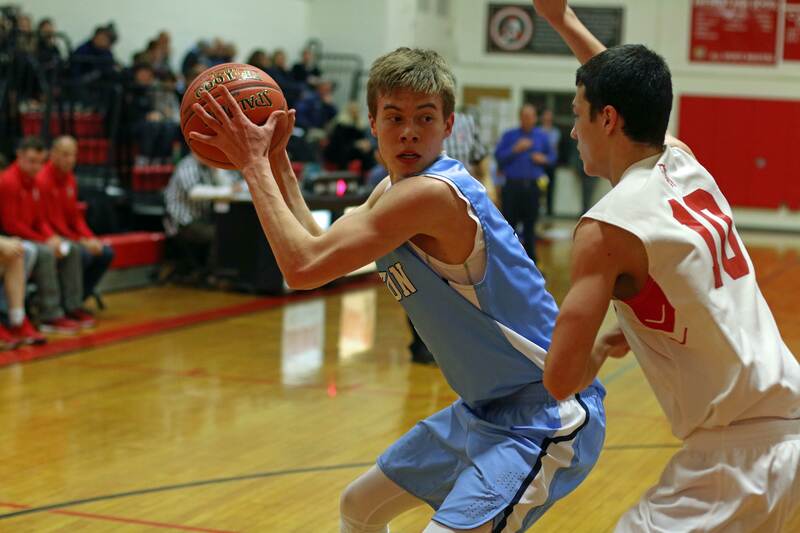 Led by Max McKenzie (22 points), Triton regained the lead, 52-48 with thirty-six seconds left. Enter Luke Martin. 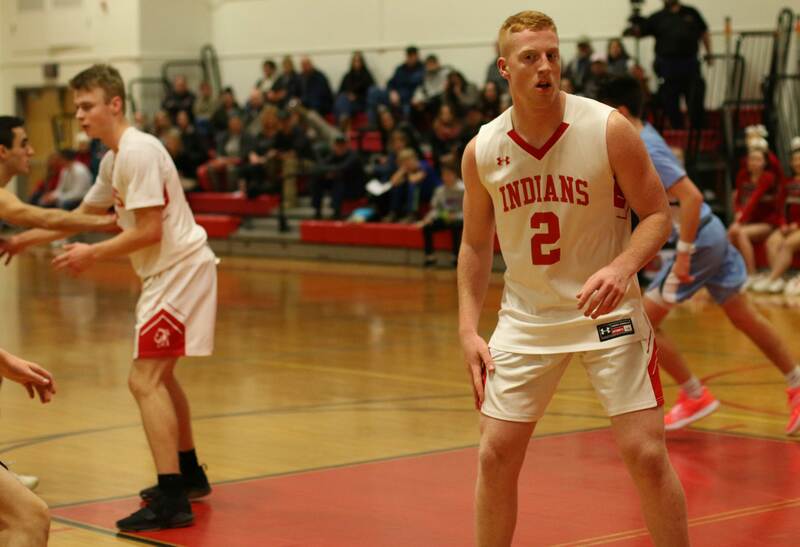 Actually, Luke had already entered (finally) in the second half and had accumulated ten points in Amesbury’s second half revival. But now down four with time running out, Luke nailed his third triple of the second half to get AHS within one. Triton’s Kyle Odoy followed with one-of-two free throws. 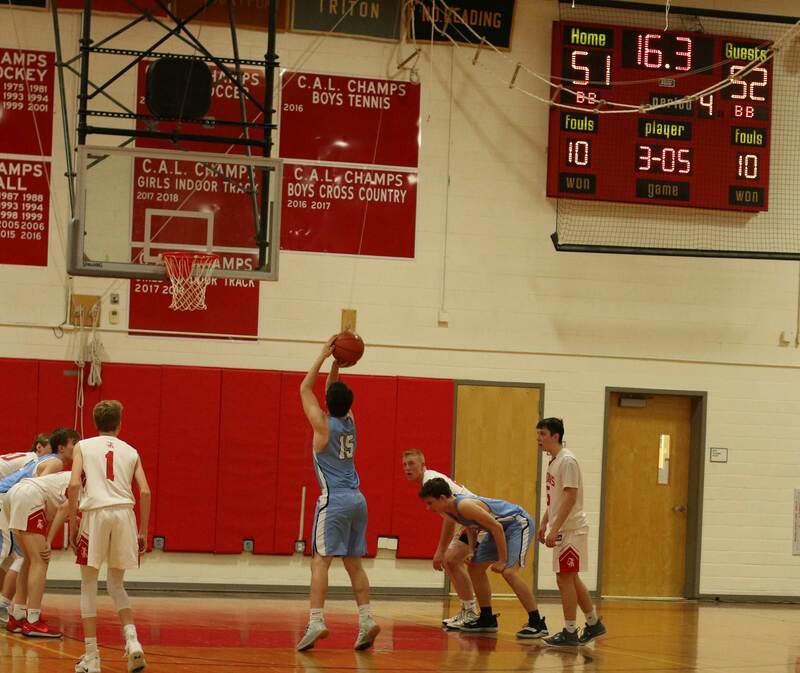 Junior Jimmy Gjikoupulli finished the Amesbury comeback with a layup just before the buzzer sounded and the game reached overtime – 53-53. 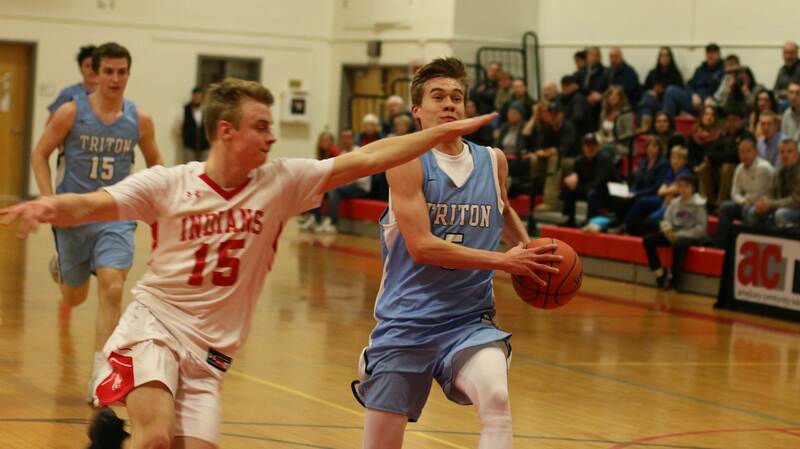 Amesbury continued their defensive pressure in the four-minute overtime and Triton struggled against it. The Vikings had three turnovers to show for the first two minutes. 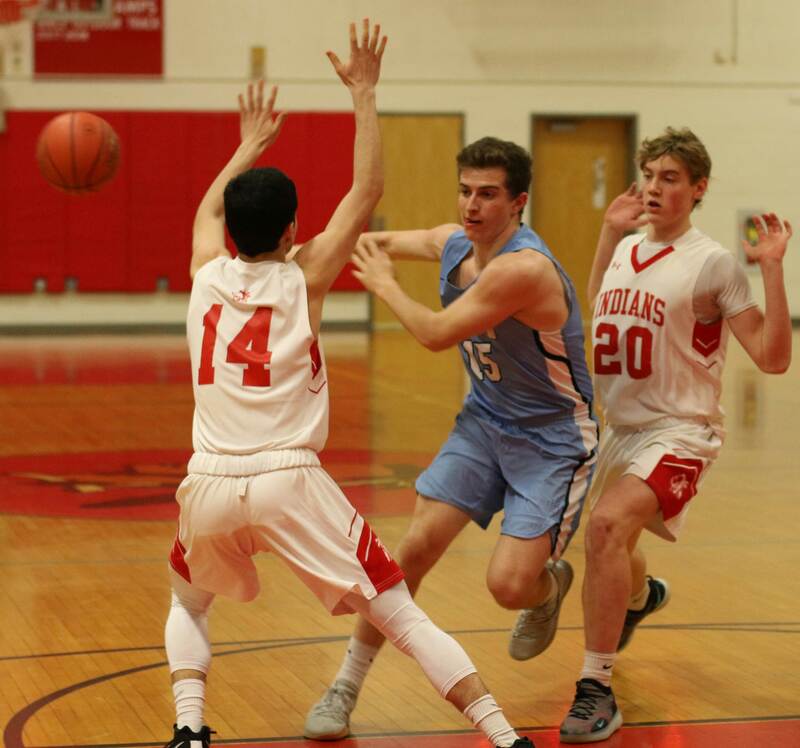 Meanwhile the Indians had a fallaway from Jaden Keliher and two free throws from Luke Martin. Then it was Luke again with 1:51 left hitting a large three. AHS now had a seven-point lead (60-53). Credit Triton. Game over? Not by the way they answered. Max McKenzie went to the hoop twice getting layups, and on the second one he was fouled. Max made the shot and now Triton was within two (60-58) with forty seconds left. Plenty of time. Amesbury opted to use as much clock as possible before shooting. Jaden Keliher took the shot, missed, and it looked as if Triton might have fifteen seconds to get an ending they liked. Looking for a hero for Amesbury? It was Kyle Donovan getting the offensive rebound off Jaden’s miss. That extended the possession and Triton was forced to foul. 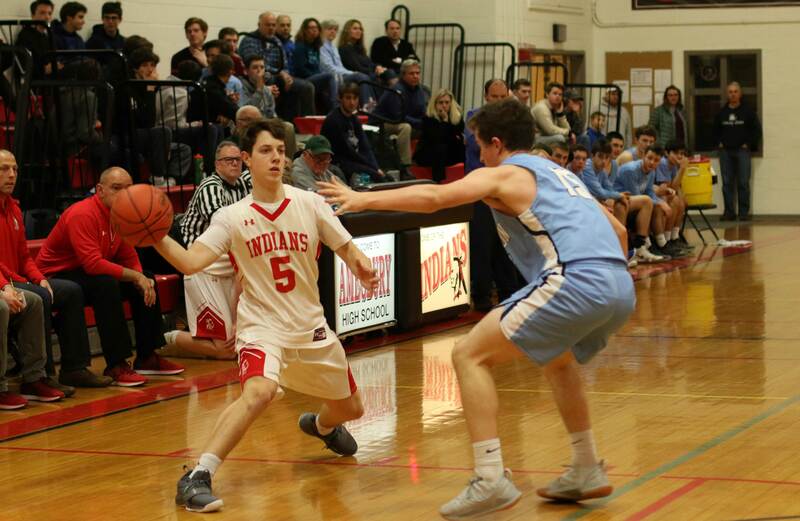 Jimmy Gjikopulli made one-of-two to give the Indians a 3-point lead. Triton struggled on their final possession and were unable to get off a three to possibly tie the game. Amesbury had an exciting 61-58 victory. 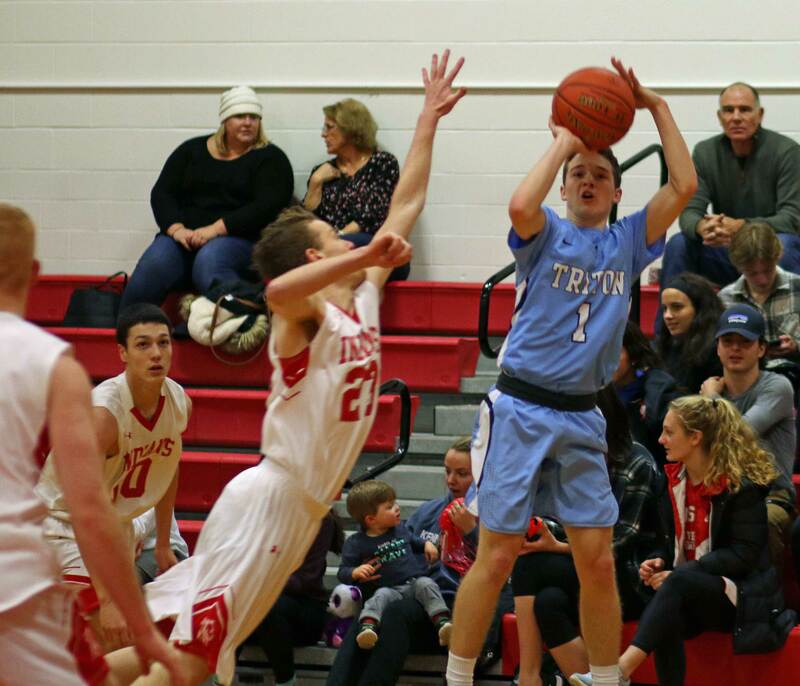 TJ Overbaugh of Triton made four three’s including three in the Vikings breakaway first period. 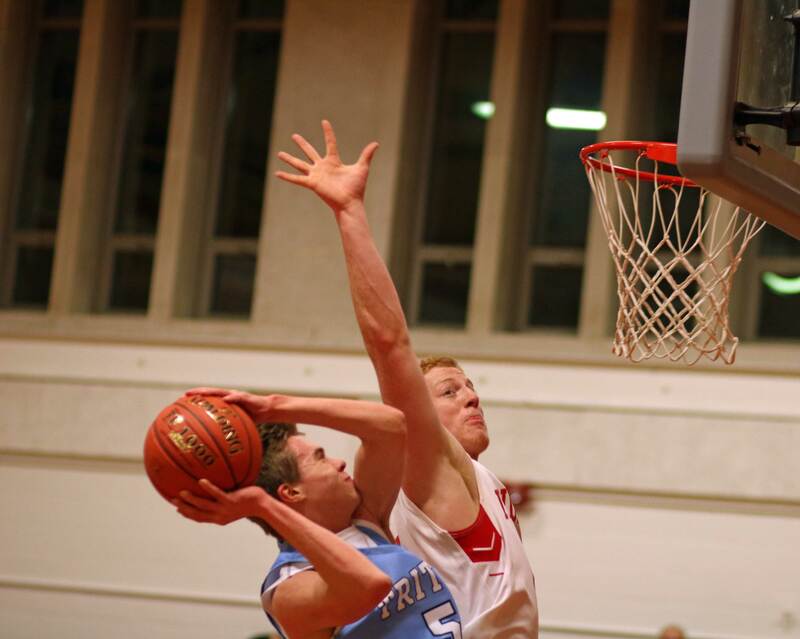 Triton defeated Amesbury 42-41 in December. Neither Nick Everett nor Luke Martin played for Amesbury in that one. TJ did and he made three triples. 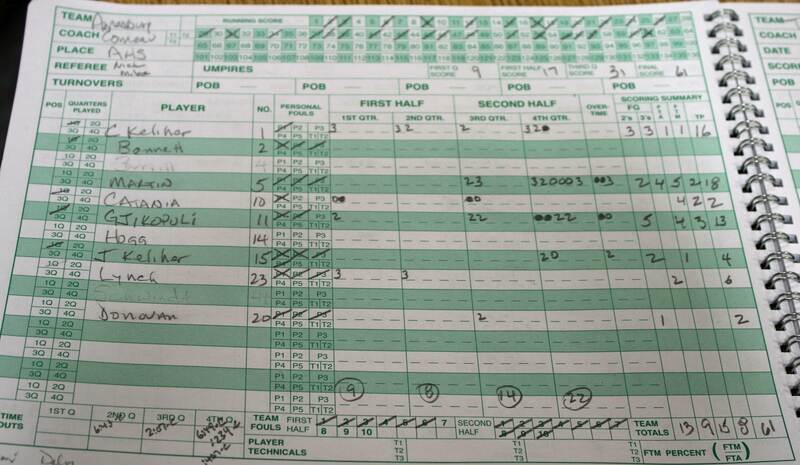 Triton ended up with twenty turnovers (by my count) while Amesbury had only ten. 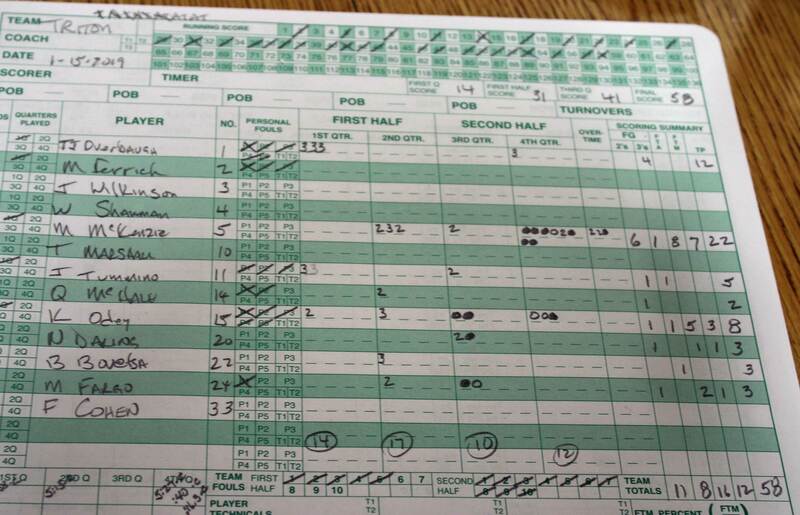 Luke Martin (18), Camden Keliher (16), and Jimmy Gjikopulli (13) reached double figures for Amesbury. Max McKenzie (22) led all scorers.